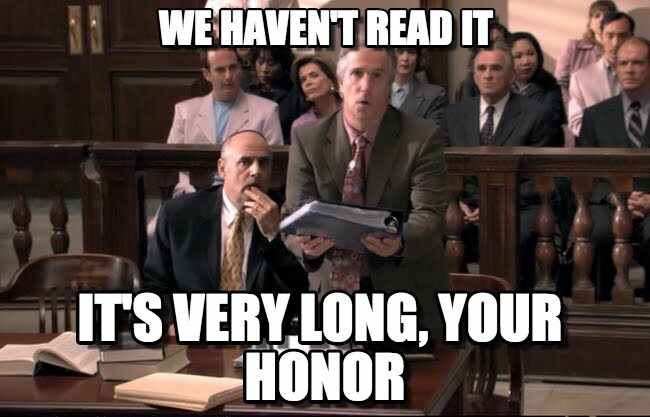 With Mrs. Sip’s birthday right around the corner, I thought I’d salute her profession and take a look at the greatest fictional lawyers. I have to preface this piece by saying that I did not include serious legal dramas, such as Law & Order (and all its subsidiaries), The Practice, Boston Legal, etc. So, without further ado, here are the litigators I’d choose to have watching my interests! One of the things that made Night Court so amazing was the banter back and forth between district attorney Dan Fielding and public defender Christine Sullivan – throw in judge Harold T. Stone and you have the makings of some fine legal repartee. Ironically, it was the sleazy, womanizing Fielding who was actually the prosecutor, while truthful and naïve Sullivan was the public defender. And who couldn’t love that wicked theme song blasted at the start of each episode! 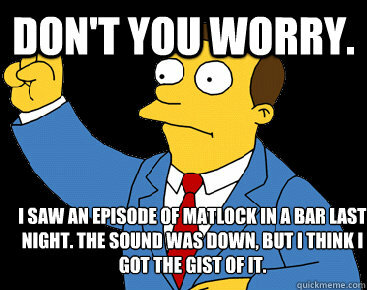 Lionel Hutz is an ambulance chasing, injury-faking, schyster, who makes every joke about lawyers seem accurate and all contempt hurled towards that profession justifiable. Hutz represented the Simpson family in a variety of suits, including Bart being hit by Mr. Burns vehicle, Bart ingesting a jagged metal Krusty-O cereal toy, and Homer being barred from a seafood buffet. This character could have had so many more great moments had its voice actor Phil Hartman not been tragically killed. The gruff, inexperienced lawyer – who seemed to be out of his element in the courtroom – eventually earned the respect of the entire court, including the judge who jailed him for contempt. Vinny’s different style of practicing law saves his wrongly accused cousin from a murder charge and possible death penalty. A sequel to the film never took place, despite a script being written. Marisa Tomei, despite winning an Oscar for her role as Vinny’s girlfriend, was not interested in reprising the character. Wow, was this ever a hard list to narrow down… I would also hire Fletcher Reede (Liar Liar), at least before he went all soft; Harvey Birdman (Harvey Birdman: Attorney at Law), because the Sip Advisor is really a rejected Hanna-Barbera animated character; and Ben Matlock and Perry Mason, simply because they’re badass lawyers who rarely lose a case, despite having the odds stacked against them! 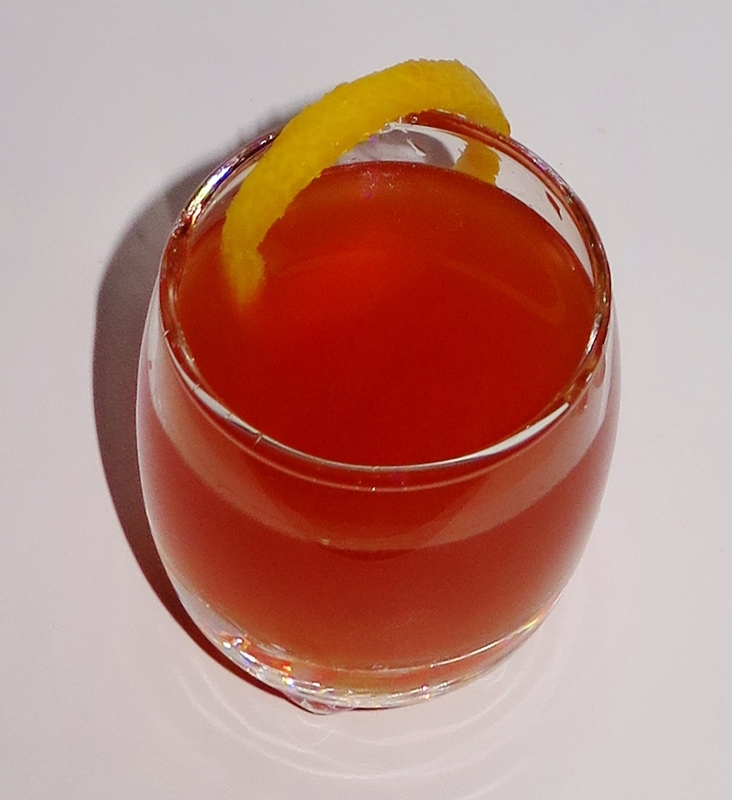 I decided to go with this shooter, over another recipe, because Mrs. Sip is a fan of Orgeat Syrup and this drink is dedicated to her, after all! It was pretty good and what I would call a Man’s Man shot, what with the classic Bourbon and Angostura Bitters combo. This would make for a Mad Man-esque cocktail, if the proportions were upped.